"The Nyacene Record Volume 1"
Dorian, prodigal prince of Avanu and agent of the galactic Guild of Assassins, is on a quest to find the key to his suppressed memories. His companion is Torrin, body-slave and military elite of Avanu with a tragic past. Their ultimate destination is unknown but the secrets locked away inside Dorian’s mind could be the means of defeating the Var, a mysterious and monstrous force of invasion that threatens all human life in the known worlds. Dorian’s Quest is a “slice of life” from the ongoing “Nyacene Record” series, which consists of various novellas and short stories that are all set in the same universe. The accounts of the Nyacene Record do not necessarily follow a linear sequence of events however, various characters and events that take place in this universe are connected in some profound way. Dorian’s Quest somewhat precedes Pandora’s Lament. 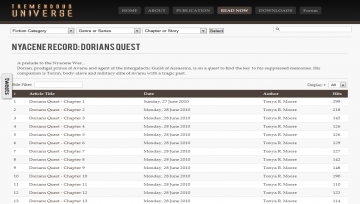 Dorian's Task has not been reviewed yet. Dorian's Task has not been recommended yet.